At any given time during your busy day if you happen to wonder what the Tanda Malaika crew are up to right at that moment, it’s guaranteed that at least a couple of us are up to something rather odd. In this case it was the Aidan and Mycah creatures ‘training’ for the next water Olympics. They will compete in the event where the athletes sprint on the ocean floor while carrying large, heavy boulders. They are both quite good at it. We played with sting rays for a while as they kept circling us and rubbing themselves against our legs. They are so cute, as soon as they see us in the water, then swarm in like B52 bombers. Danny caught a big fat tuna on a cedar plug. He fought the entire way in but Danny stayed with him and finally brought him onto the boat. We have had several large fish bite right through the leaders and take our lures. We were sailing up to Freeport to explore it and the surrounding Cays, when the sky darkened and a funnel cloud formed right in the direction we were headed. So, we decided it’d be safest if we holed up in a safe little anchorage in the North side of Bimini. Winds reached up to 30 knots today and thunder and lightning filled the sky, and a wonderful heavy rain washed the salt spray off our deck. Since it was dreary outside, after Emma completed her school work she made a wind chime from shells and sea glass she’d collected. She did a beautiful job. We also did some organizing and then watched sea planes take off right next to Tanda Malaika. This evening for dinner I made Chicken Tiki Masala with beetroot salad on the side, and blueberry cobbler for dessert. After that we watched ‘The Patriot’period together as a family since Mycah is busy studying about that time in her US History class. It’s expected that tomorrows weather will be much like today’s, so we will probably stick around here till Friday morning. The veggie boat arrives tomorrow sometime, so we will stock up on some fresh fruits and vegetables. We have not had wifi or cell service for 10 days. Now that we have it, I received over 300 emails as well as numerous texts, and some of them were from you, our sweet friends who were making sure we are okay. Thank you so much for your love, support and concern. After we said our goodbyes to our sweet family that were visiting, as well as to Jonathan, we left Nassau and continued on. Five massive cruise ships had arrived that morning and made Tanda Malaika look like a toy boat. Our adventures have continued to be so amazing. We have seen so much goodness and beauty. Nature in its own raw beauty, without the artificial layers that mankind places on it, is simply exquisite. It all makes sense, is simple and is breathtakingly beautiful. We have also met people who are so filled with love and peace. People who enjoy the adventures of living frugally off the land and who try hard to leave as small a carbon foot print as possible. People who love and laugh openly and who are not afraid to give their all and open their lives and talents to those around them. We have made some wonderful friends who share the same passions that we do and we know we will be rubbing shoulders with them for the rest of our lives. More importantly, we have spent all day every day together as a family. We miss our children that are not with us but are so grateful for the time we are having with the ones present. We laugh a lot, talk a lot and explore a lot. We eat every meal together, pray together and discover beautiful things together, and are constantly filled with deep humility and gratitude for this experience, and never tire of it. Even though by now we have seen 1000’s of flying fish, every time a school takes flight, skimming the waters surface for several hundred feet, we point them out to each other and watch in amazement. Every pod of dolphins that bow ride Tanda Malaika hear our squeals of excitement and we take more photos. Each time we set out on a crossing, dive off the stern or pull the dinghy up on a new beach, our hearts are full and we love to be where we are. While exploring we have sailed through seas so calm that the sunset is reflected perfectly in it. Jude and Mycah jumped off the bow out in open ocean and swam around to the stern, just to climb back on and do it again. 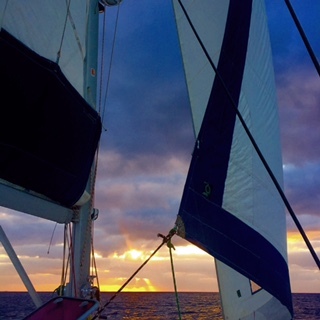 This place, where the sky is made of swirled sorbet and the ocean is an endless glass of fresh grape juice, where the breeze fills the spinnaker pulling us forward to mesmerizing places and we can openly be ourselves…this place, is our Heaven. We enjoyed our time in Nassau, but missed the tranquility of quiet islands and turquoise waters, so we set out to explore the the many little islands close by. We passed by a quaint little island with a beautifully painted home that was built to resemble a light house. Many reefs and shallow sandy areas lay ahead, so everyone sat at the bow watching for things that might not be on the navigation charts. It felt to good to feel the wind on my face and hear the water moving under Tanda Malaika. Periodically we could see the dark forms of spotted eagle ray moving in the water around us. We came to a beautiful island called Rose Island, where a white sand beach stretched long and wide and off to each end of it beautiful sandstone outcroppings lay in a bold picturesque manner. The water was bright clear turquoise and looked so cool and inviting. The clarity of the water makes it easy to anchor, because we can easily see to drop it on sand and avoid damaging coral heads. Even after letting out 50 or 75ft of anchor chain, we can still see it clearly laid out ahead of us through the transparent turquoise. We haven’t fished for a while because our freezer was so full from the 10 we caught, and I haven’t wanted to catch another darn Barracuda. There were 3 men that worked at the marina in Nassau that were there to catch our dock lines when we arrived, and we gave each of them a filleted Barracuda as a thank you. They were thrilled. We took the dinghy in to shore to explore the beach, and my Mom immediately began collecting shells and rinsing them off in the water. She is going to need an extra bag to take them all home! Bernadine, Gary, Mommy and Jonathan will be returning to the US on Tuesday. Jonathan has decided that he wants to serve a mission for our church and wants to work to make some money to prepare for it, as well as take some classes that would help him prepare. So, he will be staying with my sister and we’ll continue to work with him and help him finish his last few home school classes so he can graduate and then head out on his mission. It has been wonderful having everyone visit us, and we are going to miss Jonathan so much. The Tanda Malaika crew will be down to 6! The creatures and I grabbed cameras and set out on foot to explore the streets of Nassau in hopes of finding the famous straw market. Bernadine, Gary and Mommy caught a cab and we figured we’d eventually meet up. Danny would rather have a root canal with no block than join us in an adventure that might involve shopping, so he stayed at the boat. We walked over the tall bridge, and from it could see the many vessels motoring back and forth. It was busy like a highway, some charter vessels filled with snorkelers, some delivering goods, some commercial fishing vessels and some private – all with important agendas to fulfill. Some of them were so loaded down with an assortment of things that I was amazed they still floated. A flock of lazy seagulls slept on a rooftop and below them, men on boats overloaded with conch hurried to deliver their fresh harvest. We walked for about half an hour through an area where beautiful old buildings stood vacant and fading. Streets were quiet and a few cars hurried past en route to some place more lively. The Bahamian really love a particular shade of pink for their buildings. In the distance we could see 3 massive cruise ships anchored, and as we neared the area, suddenly our surrounding became alive, bright paint and signs covered the walls and people talked and laughed as they mingled in the streets. The straw market was an interesting place. A large building with booths lined in a grid pattern inside, all with “local” straw bowls and bags, bright backpacks and purses obviously made in Central and South America, wood work mostly made in Africa and China and t-shirts printed in bulk from various places. Each little lady at the neatly stacked booths called you to hers using the same lines of: “I want you to be my first customer of the day, what would you like from my store? A special discount for you. How about this hat. It is usually $25 but I’ll give it to you for $20 but, because you’re so beautiful, how about $15…just for you as my first customer.” The same lines used everywhere – even after an hour of people shopping I was still considered their first customer, just as everyone else was. I smiled as I watched people leave with big bags of goods, huge smiles on their faces as they felt accomplished in purchasing local hand made stuff at amazing discounted prices. We eventually made our way back to Danny on Tanda Malaika, with exciting things to tell him about our adventure through town. Aidan was definitely the hit of the day, as every man and boy stood watching him in amazement as he rode his skateboard. What a fun place with happy, friendly people.